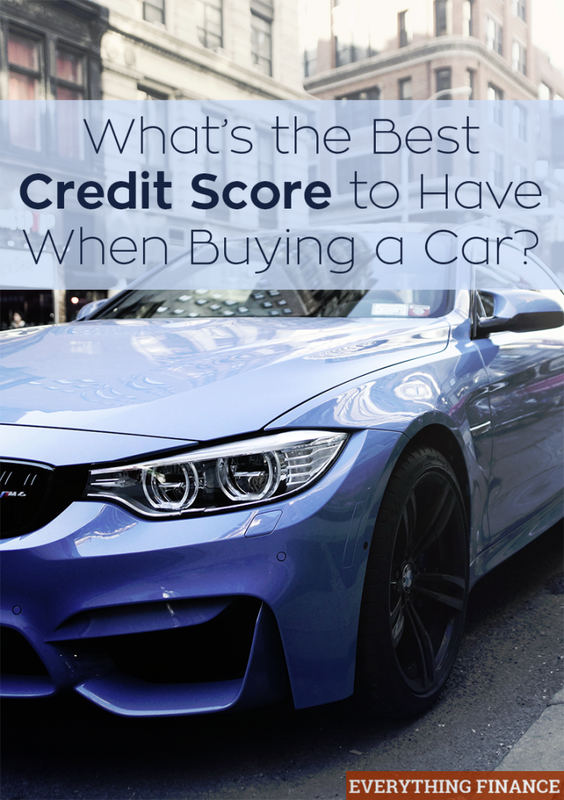 What's the Best Credit Score to Buy a Car? When you go to buy a car, you want to get the best deal. While getting a good deal relies on your negotiating skills to a certain extent, getting the most bang for your buck also includes getting a good interest rate on your auto loan. However, unless you have a good credit score, you won’t be able to get the best interest rate. As a result, it helps to be educated about credit score ranges, and how you can improve your score to get the best possible interest rate. You can find out about the best credit score to buy a car by heading over to myFico.com. The web site offers a handy calculator that can help you see how much you could save with a better credit score. According to the site, using national averages, you should be able to get an interest rate of 3.201% if you have a credit score of over 720 and finance a new car on a 48-month term. If you are below 620, there is a good chance that you will have to pay more than 9% on a car loan. Additionally, you might have trouble buying a car with a loan if your credit score is below 600, although some dealerships offer financing to those with credit scores as low as 580. But you will pay a premium in a higher interest rate, spending more money over time. It can be a good idea to check your credit score before you buy a car. This will give you an idea of what to expect — and give you an idea of what you might need to do to help fix your credit to some degree before you apply for a car loan. You may have to pay for your credit score, but checking it can be valuable. You should also check your credit report for errors, and try to get them fixed. If your identity has been stolen, or if there is a mistake on your credit report, it can contribute to a lower credit score. Making sure all your payments are on time. Keeping old accounts open until after you buy your car to show a longer credit history. With a better credit score, you will be able to get a better deal on a car.